Cheeky Prince Louis has been snapped almost poking his grandfather in the eye in an adorable unseen photograph. 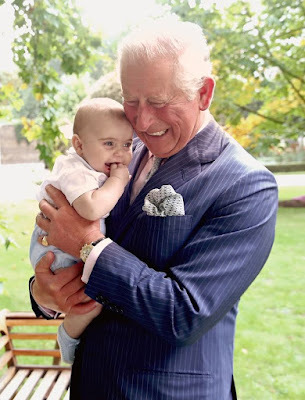 The inquisitive six-month-old leans forward in mother Kate's arms and plants his tiny fingers over Prince Charles' face - causing him to burst out laughing. The heir to the throne can also been seen squeezing his eyes closed to avoid a mishap, while the rest of the family giggle at the youngster's antics. 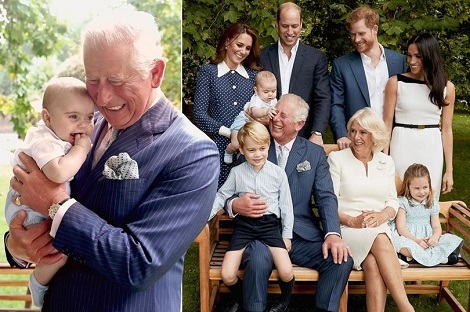 In another stunning photograph of the pair, Charles cuddles Louis on his chest and gently places his cheek on top of the tot's head. 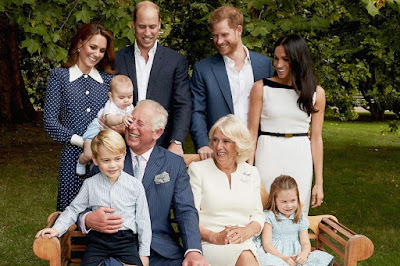 The new images follow several other official photographs released over the past week to mark Prince Charles' 70th birthday and show the strong bonds between the Prince of Wales, Camilla and their grandchildren. They feature the Duke and Duchess of Cornwall along with Charles' two sons, Prince William and Prince Harry, and their wives Kate Middleton and Meghan Markle.